A force on the front line for the Dartmouth Big Green, Corey Kalk ’18 led the men’s ice hockey team this year as an alternate captain during a thrilling season. The men’s hockey team finished with a record of 16-17-2, and 11-0-1 in the Eastern College Athletic Conference. Kalk had a very productive season himself, with eight goals and 21 points, but statistics can’t begin to explain what Kalk meant to this hard-working group. Kalk is a natural born leader, and the “A” stitched on his jersey represented his knack for motivating others. Before coming to Dartmouth, Kalk took his talents to the North York Rangers of the Ontario Junior Hockey League. While with the Rangers in the 2012-13 season, he finished seventh in the league, scoring 76 points and 31 goals. Upon arriving on campus, Kalk became part of one of Dartmouth’s most storied athletic programs, which has consistently produced NHL talent along with highly competitive teams. He was met by a tight-knit group of players who he thinks had a great deal of influence on shaping his Dartmouth career. Coming to Hanover can be a scary and intimidating thing for any new student, but Kalk thrived under the guidance of his upperclass teammates. He recorded nine points his freshman season and scored four goals, making him a contributor to the team despite his lack of collegiate experience. Sophomore year brought new opportunities for Kalk as he came into his own as a scorer and leader on the team. Kalk finished his sophomore campaign with 17 points and 10 goals, but that team would reach heights Kalk had never been to before. Dartmouth was ranked seventh in the ECAC that year, having just survived a razor thin series against Colgate University that ended in a double overtime 4-3 victory in the decisive third game for Dartmouth. The road didn’t get easier for the men in green, however, as they were slated to play Yale University, the seventh-ranked team in the country and second in the ECAC, with a trip to Lake Placid for the ECAC semifinals on the line. Yale was a heavy favorite coming into the series, but in the second period of game one, Kalk was able to find his classmate River Rymsha ’18 for the first goal of the series. 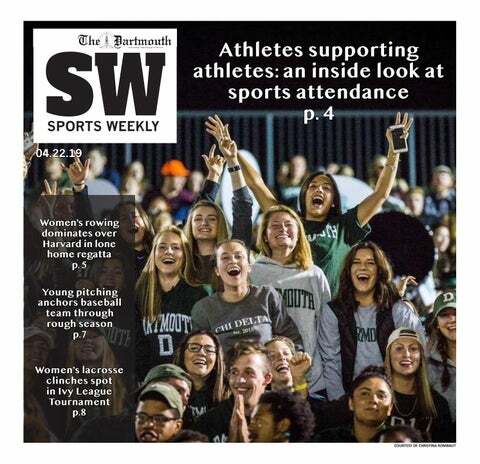 This changed the tone of the game as Dartmouth was able to pull out a 4-3 overtime victory. Dartmouth would go on to secure a 2-0 sweep after defeating Yale 2-1 in the second game. Kalk notes that one of his most memorable experiences while with the Big Green was sweeping Yale. “Being major underdogs in the second round against Yale, [who was] ranked seventh in the country, and sweeping them was an amazing feat and something I will remember for the rest of my life,” Kalk said. Kalk continued to grow his junior year and made himself a top offensive contributor on the team. He finished second on the team in goals and points with 11 and 23, respectively. Kalk also recorded his first career hat trick his junior year at the Thompson Arena against Saint Lawrence University. The Dartmouth team would go on to be eliminated in the first round of the ECAC playoffs by the Yale Bulldogs. This year, Kalk was named an alternate captain for the Big Green as he found himself filling the mentoring role that was so important to his development. One of the highlights of this year came in the ECAC playoff series against Saint Lawrence University. Being the fifth seed in the ECAC tournament, the Big Green got to host the first round playoff series. After winning game one, Dartmouth faltered and lost game two, setting up a winner-take-all game three on Sunday. With the score tied 1-1 in the second period of game three, Kalk came up big and found the back of the net on a breakaway. This goal would hold up as the winning goal as the Big Green went on to win 2-1. Dartmouth would eventually lose in the ECAC quarterfinals to No. 4 Harvard University, led by Team USA hero Ryan Donato. Kalk has been a constant at center for Dartmouth, always bringing an abundance of energy and passion to the ice. He was known around the league as an intense player who would always be ready to stand up for his teammates. Just watching him play, it was very easy to see he truly played for his teammates. Kalk has had an incredible career as a member of the Big Green and will forever be thankful for his own Dartmouth experience.